carolabriney.com » The Last Organizing Workshop You Will Ever Need – Pittsburgh, Pa. Please Share This With All of Your Pittsburgh Friends. If you are outside of the Pittsburgh area and would like me to come to your town please contact me. 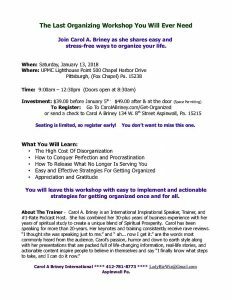 Join International, Inspirational Speaker, and Trainer – Carol A. Briney as she shares easy and stress-free ways to organize your life. And Help You To Stay That Way.